Discussion in 'Chainsaws' started by GlocknStihl, Nov 8, 2018. I wanted to clean up this 16" 325 bar for my 261 and I've heard it many times, so I went to Tractor Supply and picked up some Light Ford Gray. It's very close to Stihl gray. Didnt turn out too bad if I do say so myself. Poleman, MustangMike, leadfarmer and 4 others like this. leadfarmer and Mkinslow like this. Print one out on paper and make a stencil, cut the logo out with an exacto. MustangMike, GlocknStihl and leadfarmer like this. Go to your local print shop have them print a sticker for $2 a piece don't forget to put clear coat on it. Here's one I did. smokey7, Sty57, Dub11 and 5 others like this. huskihl, Mkinslow, leadfarmer and 1 other person like this. Sty57, Mkinslow and GlocknStihl like this. The reason I did all this, is because this bar is in great condition. Just someone had stored it badly. Plus it gave me a great opportunity to try that paint for a match. Mkinslow and leadfarmer like this. redline4, Sty57, drf256 and 2 others like this. I’ve used GM arctic white before with good results. Dub11 and huskyboy like this. SELLING MINTY Stihl 056 Mag 2! 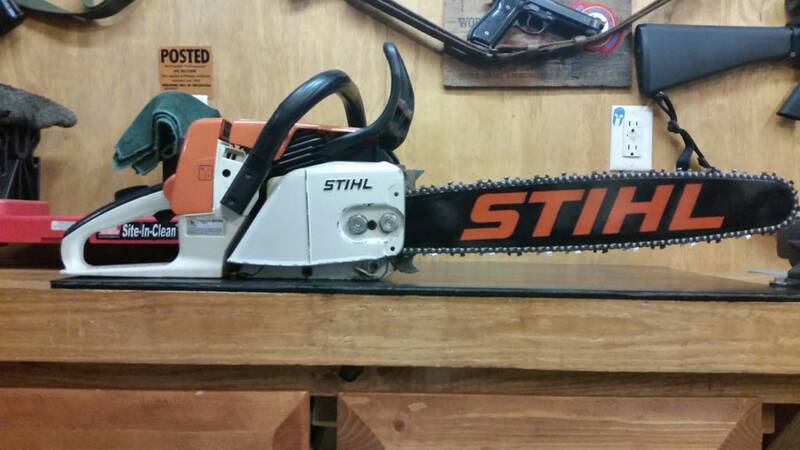 Stihl, but which one is this? SELLING Stihl 026 - heated handles... anyone?? ?